This article is about food days. For food weeks, see List of food weeks. For food months, see List of food months. March 1 Beer Day Beer was banned for decades in Iceland, but allowed again on 1st of March, 1989. April 14 Black Day A single people's day celebrated with jajangmyeon, the black noodle dish which gave the day its name. The United States has over 175 days related to awareness of specific foods or drinks. Foods at a buffet. 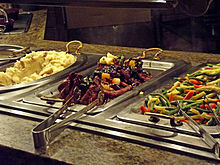 National Buffet Week occurs beginning on January 2 each year in the United States. In the United States, March 23 is National Chips and Dip Day. A grilled cheese sandwich. April 12 is National Grilled Cheese Sandwich Day. May 5 is National hoagie day in the United States. 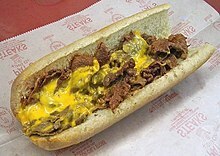 Pictured is a cheesesteak sandwich prepared with a hoagie roll. Escargot at a restaurant. May 24 is National Escargot Day. 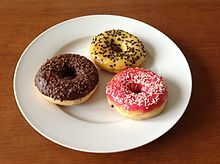 National Doughnut Day occurs on the first Friday of June every year. National Corn on the cob day occurs on June 11. June 15 is National Lobster Day. National Chili Dog Day occurs on the fourth Thursday of July. 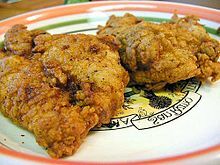 National Fried Chicken Day occurs on July 6. July 14 is National Mac & Cheese Day. July 24 is National Tequila Day. Pictured is a Tequila Sunrise. 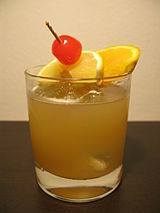 August 25 is National Whiskey Sour Day. ^ "February 5th is World Nutella Day!". Foodimentary - National Food Holidays. 2017-02-05. Retrieved 2017-03-02. ^ "On World Idli Day, try out these 5 amazing versions of the steamy white wonder!". The Indian Express. March 30, 2017. ^ "International Carrot Day". 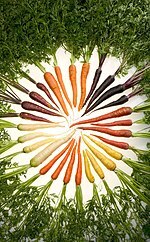 www.carrotday.com. Retrieved 2018-04-04. ^ Jancis Robinson, ed. (2006). The Oxford Companion to Wine (3rd ed.). Oxford University Press. p. 421. ISBN 0-19-860990-6. ^ "Israel gears up for International Hummus Day". The Jerusalem Post - JPost.com. Retrieved 28 July 2015. ^ SureshikaThilakarathna. "Today is World Milk Day". news.lk. Retrieved 28 July 2015. ^ Summers, Alicia (May 20, 2015). "Previewing International Sushi Day". CBS News 8. Retrieved July 8, 2015. ^ "World Chocolate Day: What your chocolate says about you". NewsComAu. July 7, 2014. Retrieved 4 July 2015. ^ Caster, Yvette (September 29, 2015). "5 wicked ways to spike your coffee". Metro. Retrieved September 29, 2015. ^ "Where to get a free cup of coffee to celebrate International Coffee Day!". ABC13 Houston. Retrieved 28 July 2015. ^ Helena Horton (1 October 2014). "WORLD VEGETARIAN DAY: The most annoying things people say when they find out you're a herbivore". mirror. Retrieved 28 July 2015. ^ a b Mosely, Brian (October 17, 2005). "National days, weeks and months abound". Shelbyville Times-Gazette. Archived from the original on September 26, 2010. ^ a b "World Egg Day". Cute-Calendar.com. October 8, 2014. ^ "Best porridge title scooped by US". BBC News. BBC. 11 October 2009. ^ "World Porridge Day". Mary's Meals. Retrieved 30 September 2016. ^ "American wins world porridge title". Daily Telegraph. 11 October 2009. ^ "World Food Day: Millions malnourished in India". BBC News. Retrieved 28 July 2015. ^ "It's World Tripe Day!". Los Angeles Times. October 24, 2014. ^ "World Pasta Day 2016: Everything you need to know". Metro. 25 October 2016. Retrieved 23 October 2017. ^ "Vegan-friendly city going 'whole hog' as 70th anniversary marked". BBC News. Retrieved 28 July 2015. ^ "Who's doing what, where for Philly Vegan Day". Philly.com. 18 October 2014. Retrieved 28 July 2015. ^ "UN, AU join forces against acute malnutrition". Standard Digital. Kenya. ^ "Toasty Marshmallow Pop-Ups Are Taking Over The CBD Tomorrow". www.theurbanlist.com. Retrieved 2018-05-17. ^ Steff Deschenes (2014). Eat the Year: 366 Fun and Fabulous Food Holidays to Celebrate Every Day. Running Press. p. 117. ^ "Calendário de datas comemorativas". ^ "Food Freedom Day - CFA-FCA". www.cfa-fca.ca. ^ "James: A humble declaration of Jamaican Patty Day - The Star". ^ "Tag des deutschen Apfels" (in German). Kleiner-Kalender.de. October 8, 2014. ^ "Tag des Deutschen Bieres". Kleiner-Kalender (in German). October 8, 2014. ^ "Day of German Butterbrot". Cute-Calendar.com. October 8, 2014. ^ "Tag der Suppe" (in German). Kleiner-Kalender.de. October 8, 2014. ^ "Bon Appetit Wednesday: Celebrating Germany's National Soup Day!". Antiquity Now. November 19, 2014. Retrieved July 23, 2015. ^ "National Undhiyu Day Celebrate First ever Indian Food Day". itsPotluck. ^ "Anand to celebrate National Milk Day in Kurien's memory". The Times of India. November 26, 2016. Retrieved November 28, 2016. ^ Sreeraman (April 19, 2009). "Italy Celebrates First-Ever National Espresso Day!". Medindia. ^ "A waiter serves a freshly brewed espresso at a cafe terrace on Campo..." Getty Images. April 17, 2009. Retrieved July 23, 2015. ^ "A Guide to Japanese Puns: Holiday Edition". Retrieved 1 February 2017. ^ a b Gale, Alastair (November 11, 2013). "On Pepero Day, a Japanese Rival Lurks". WSJ. Retrieved July 23, 2015. ^ "Give a pretzel to your sweetheart". Luxemburger Wort. March 14, 2012. ^ "Joepie, het is nationale pannenkoekdag" [Yippie, it is national pancake day] (in Dutch). The Netherlands: RTV Noord-Holland. March 30, 2012. ^ "Over Nationale Pannenkoekdag" [About National Pancake day] (in Dutch). pannenkoekdag.nl. ^ "National Chocolate Fish Day". National Chocolate Fish Day. Retrieved 2018-10-05. ^ "Waffle Day". Cute-Calendar.com. October 8, 2014. ^ "Cinnamon Bun Day". Temadagar. 29 January 2015. ^ Karlsson, Ulrik (7 November 2014). "I dag firar vi kladdkakans dag". Göteborgs-Posten. Retrieved 28 July 2015. ^ "Melon Day". Cute-Calendar.com. October 8, 2014. ^ "Things to do in Clitheroe, Lancashire". About Britain. Excelsior Information Systems Ltd. 2016. Retrieved January 2, 2016. ^ .co.uk, Mirror (29 May 2015). "What's the tastiest, most dunkable biscuit? Vote in our #NationalBiscuitDay poll". Retrieved 1 February 2017. ^ Doré, Louis (5 June 2015). 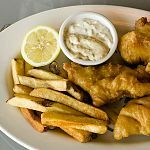 "National fish and chips day: the ten best shops in the country". The Independent. London. Retrieved 28 July 2015. ^ "Its National Fish & Chip Day 2015! So here are the UK's best chippies to try before you die - Metro News". Metro. Retrieved 28 July 2015. ^ "National burger day website". nationalburgerday.co.uk. Retrieved 10 June 2016. ^ "Madcap food fans create ice cream that tastes like a burger". The Sun. Retrieved 24 February 2016. ^ Hooton, Christopher (August 22, 2014). "National Burger Day: Get 20% off basically all good London burgers next week". The Independent. Retrieved 28 July 2015. ^ "National Burger Day is coming". Shortlist. 10 June 2016. Retrieved 10 June 2016. ^ "VIDEO: Battle of the burgers at Sheffield Meadowhall for National Burger Day". thestar.co.uk. Retrieved 28 July 2015. ^ a b c d e f g h i j k Severson, Kim (May 30, 2007). "Having a Snack? Make It a Holiday". The New York Times. ^ "Bloody Mary Day". Retrieved 1 February 2017. ^ "National cream puff day". Eatocracy. 2 January 2013. Archived from the original on 4 January 2013. Retrieved 18 January 2018. ^ a b c d e f Glover, Katherine (June 5, 2009). "National Doughnut Day and Other Food Holidays". Moneywatch. CBS News. ^ Post, The Huffington (January 5, 2011). "National Whipped Cream Day Spurs Sales, Criticism". The Huffington Post. Retrieved September 28, 2015. ^ "National Whipped Cream Day, January 5". Food.com. Retrieved September 28, 2015. ^ Pace, Gina (January 8, 2014). "Eats Beat: New York dining empires continue to expand". NY Daily News. Retrieved 22 July 2015. ^ "2nd Annual National Cassoulet Day in NYC". The Epoch Times. 18 July 2015. Retrieved 22 July 2015. ^ "We're Halfway There + Food Lover's Cleanse Day 8 Menu". Bon Appétit. Retrieved 22 July 2015. ^ Aasen, Eric (January 21, 2012). "Sunday is National Pie Day, when pie takes center stage". The Dallas Morning News. ^ a b c d e "Fun Facts". National Peanut Board. ^ Green, Treye (January 24, 2014). "National Peanut Butter Day: 10 Fast Facts About Peanut Butter". International Business Times. Retrieved July 23, 2015. ^ "Holiday Insights : Chocolate Cake Day". holidayinsights.com. Retrieved 22 July 2015. ^ "Got milk? It's National Chocolate Cake Day". WTOP. Retrieved 22 July 2015. ^ Ansberry, Clare (11 December 2014). "Today Is National Noodle Ring Day, So If You've Got a Bundt Pan, Use It". The Wall Street Journal.com. Retrieved December 16, 2014. ^ a b c d e "Why Fake Holidays Are Your Best Defense Against Competition This Black Friday". Inc.com. 25 November 2014. Retrieved December 9, 2014. ^ a b c d e f g "Why the Best Shopping Holiday Is One You Make Up Yourself". www.slate.com/. 28 November 2014. Retrieved 30 November 2014. ^ "February 2 is National Tarter Tot Day". Foodimentary. ^ "Saturday is National Ice Cream for Breakfast Day". The News-Press. February 3, 2015. Retrieved September 28, 2015. ^ Podmoroff, Dianna (2005). 365 Ways to Motivate and Reward Your Employees Every Day - With Little or No Money. Atlantic Publishing Company. p. 266. ISBN 9780910627511. ^ a b c "Consuming Passions". U.S.A (United States of America): The Economic Times. April 28, 2011. ^ "It's National Pizza Day and National Bagel Day". NY Daily News. Retrieved 2016-12-08. ^ a b c d Hirsch, J. M. (August 18, 2004). "Food turns eating into stream of holidays". Associated Press via Kentucky New Era. ^ "The absolute best cocktails for National Margarita Day". Fox News. February 20, 2015. Retrieved September 28, 2015. ^ "Official Website of National Margarita Day 2015". National Margarita Day 2015. Retrieved 28 July 2015. ^ Cruz, Nancy (February 23, 2015). "Somethin' to Celebrate- National Banana Bread Day". KTLA. Retrieved September 28, 2015. ^ "National Banana Bread Day, February 23". Food.com. Retrieved September 28, 2015. ^ "February 29 is Leap Day calls for a celebration! National Frog Legs Day". Foodimentary. ^ Reyes, Liz (March 2, 2015). "Grab a fork for National Banana Creme Pie Day". FOX 8 WVUE New Orleans News, Weather, Sports, Social. Retrieved September 28, 2015. ^ Bonnie G #2. "National Cheese Doodle Day". food.com. Retrieved 28 July 2015. ^ "March 5 is National Cheez Doodle Day". Foodimentary - National Food Holidays. Retrieved 28 July 2015. ^ a b c d e f g h i Rem, Kathryn (March 9, 2010). "Yesterday was National Crabmeat Day and you missed it". The State Journal-Register. ^ "National Meatball Day – March 9". www.nationaldaycalendar.com. March 9, 2015. ^ a b "Johnny Appleseed Day". gone-ta-pott.com. ^ "National Steak Day". whatnationaldayisit.com. Retrieved 5 June 2017. ^ "Pi Day - Celebrate mathematics on March 14". Retrieved 1 April 2018. ^ "Photos: National Corndog Day". daytondailynews.com. Retrieved 28 July 2015. ^ the National Corndog Day website. "National Corndog Day March 22". Mason City Globe Gazette. Retrieved 28 July 2015. ^ a b c d e f g h i j k l m n o p q Goldstein, Darra (2011). "National Turkey Day". Gastronomica. 11 (4). ^ "March 27: International Whiskey Day". Carriage Towne News. Retrieved 28 July 2015. ^ Rasputin Todd (21 March 2014). "Food events: March 21–30". Cincinnati.com. Retrieved 28 July 2015. ^ Koonse, Emma (April 2, 2012). "National Peanut Butter and Jelly Day Today". The Christian Post. ^ "Why We Love National Burrito Day". 4 April 2018. ^ "Candy Holidays". Archived from the original on 2013-10-29. Retrieved 2013-11-01. ^ Verive, John (April 6, 2013). "Sunday is National Beer Day -- raise a glass to L.A.'s history". Los Angeles Times. ^ "National Cheese Fondue Day, April 11". Food.com. April 1, 2015. Retrieved July 23, 2015. ^ Thorn, Bret (April 12, 2012). "Grilled cheese sandwiches spotlighted". Nation's Restaurant News. Penton Media. ^ Reitz, Scott (April 19, 2011). "When Every Day Is a National Food Day, Is Food Still Special?". Dallas Observer. Retrieved September 12, 2015. ^ Prince, John. "A Brief History of Jelly Beans". CandyFavorites.com. Retrieved October 22, 2017. ^ "National pigs in a blanket day". Eatocracy. CNN. April 24, 2012. ^ House of Representatives - Thursday, April 26, 2001 - National Pretzel Day. Congressional Record of the United States House of Representatives. April 26, 2001. ^ Bites (April 27, 2011). "Carnivores rejoice! It's National Prime Rib Day". NBC News. Retrieved September 12, 2015. ^ Baltimore Sun (1 May 2013). "May 5: National Hoagie Day". baltimoresun.com. Retrieved 3 July 2015. ^ "National Hoagie Day". myfoxphilly.com. 5 May 2014. Retrieved 3 July 2015. ^ "Wellcat's Spring Holidays". Ruth and Thomas Roy. Retrieved November 9, 2012. ^ Group, Sinclair Broadcast (July 22, 2015). "GDC: National Pizza Party Day!". WTTE. Retrieved July 22, 2015. ^ "May 16th is National Barbecue Day". ^ a b c d e f g h Ansberry, Clare (December 11, 2014). "Today Is National Noodle Ring Day, So If You've Got a Bundt Pan, Use It". The Wall Street Journal. Retrieved July 22, 2015. ^ Smith, Emily (May 23, 2012). "National taffy day". eatocracy.cnn.com/. Retrieved 16 September 2013. ^ "National Escargot Day, May 24". Food.com. May 1, 2015. Retrieved July 23, 2015. ^ a b "National Wine Day and 36 Other Official Days to Drink Wine". Wine Folly. ^ "May 26th National Blueberry Cheesecake Day". ^ "Saturday is National Italian Beef Day". May 26, 2017. Retrieved July 3, 2017. ^ Thornby, Hannah (May 28, 2015). "Happy National Brisket Day: The year in smoked meats". Austin American-Statesman. Retrieved 23 July 2015. ^ "National Brisket Day, May 28". Food.com. May 1, 2015. Retrieved July 23, 2015. ^ "National Donut Day: Pastry Party Ahead". NBC Southern California. Retrieved 28 July 2015. ^ "Happy National Rotisserie Chicken Day, with thanks to Boston Market". The Balance Sheet. Retrieved 28 July 2015. ^ Baltimore Sun (2 June 2015). "Boston Market rotisserie chicken - Baltimore Sun". baltimoresun.com. Retrieved 28 July 2015. ^ Katzen. "National Rocky Road Day". food.com. Retrieved 28 July 2015. ^ WNCN Staff (26 May 2014). "RALEIGH: Clueless Chick: Celebrate National Rocky Road Day - FOX10 News - WALA". fox10tv.com. Retrieved 28 July 2015. ^ Liz Reyes (3 June 2015). "National Chocolate Macaroon Day". fox8live.com. Retrieved 28 July 2015. ^ "June 3 is National Chocolate Macaroon Day". Foodimentary - National Food Holidays. Retrieved 28 July 2015. ^ "Egg McMuffins will be 63 cents June 3: National Egg Day". Milford Mirror. Retrieved 28 July 2015. ^ "Eggs are Celebrated on National Egg Day Despite Shortage". syr.edu. Retrieved 28 July 2015. ^ Wildflour. "National Egg Day". food.com. Retrieved 28 July 2015. ^ "From the Producers Pod: June 5, 2014 Edition". PAhomepage.com. 5 June 2014. Retrieved 23 August 2014. ^ "June 5 is National Cheese Day". Foodimentary. ^ Adeeyo, Dara (June 4, 2014). "Celebrate National Cognac Day". Jet. Retrieved September 12, 2015. ^ "National gingerbread day". cnn.com. June 5, 2012. Retrieved 28 July 2015. ^ KC_Cooker. "National Gingerbread Day". food.com. Retrieved 28 July 2015. ^ "Tonight: Free food for National Moonshine Day". Philly.com. 5 June 2014. Retrieved 28 July 2015. ^ "National applesauce cake day". National applesauce cake day – Eatocracy. June 6, 2013. Archived from the original on September 29, 2015. Retrieved September 28, 2015. ^ a b "Days in June, 2016". Retrieved 1 February 2017. ^ "REFRESHING! Today is National Iced Tea Day". wpxi.com. Retrieved 28 July 2015. ^ Katherine Ducharme (10 June 2015). "Teavana gives free tea in honor of National Iced Tea Day". fox28.com. Retrieved 28 July 2015. ^ "Living Well with National Corn on the Cob Day". Fox 59. Retrieved 28 July 2015. ^ "American Food Holidays". State Symbols USA. Retrieved 1 March 2013. ^ "Dive into these recipes for National Lobster Day". Fox News. June 13, 2014. Retrieved 28 July 2015. ^ "Celebrating National Fudge Day with Levee Mercantile". FOX2now.com. Retrieved 28 July 2015. ^ WFSB Staff (16 June 2015). "Today is National Fudge Day". wfsb.com. Retrieved 28 July 2015. ^ ABC News. "National Vanilla Milkshake Day". ABC News. Retrieved 28 July 2015. ^ "National Ice Cream Soda Day". FOX2now.com. Retrieved 28 July 2015. ^ HokiesMom. "National Ice Cream Soda Day". food.com. Retrieved 28 July 2015. ^ Lucchesi, Paolo (June 19, 2015). "B. Patisserie will be full of kouign amann on Saturday". Inside Scoop SF. Retrieved 28 July 2015. ^ "National Peaches and Cream Day". AnnArbor.com. Retrieved 28 July 2015. ^ "National chocolate pudding day". cnn.com. June 26, 2012. Retrieved 28 July 2015. ^ "National Chocolate Pudding Day 2015". The Food Channel®. Retrieved 28 July 2015. ^ Ross, Chris (June 23, 2015). "Karina's recipe salutes Ceviche Day". The San Diego Union-Tribune. Retrieved 28 June 2015. ^ "National Ceviche Day at mas". Chicago Food Magazine. Retrieved 28 July 2015. ^ "Celebrate National Tapioca Day With A Boba Tea From These Bay Area Best As Chosen By CBS SF Readers". cbslocal.com. Retrieved 28 July 2015. ^ Kitchen Witch Steph. "National Tapioca Day". food.com. Retrieved 28 July 2015. ^ "Blue Bunny Celebrates as Bomb Pop Turns 50". Allbusiness.com. May 17, 2005. ^ a b c d "Food Days, Weeks, Months - July". UNL Food. University of Nebraska–Lincoln. ^ "Gold Star Chili Celebrates National Chili Dog Day". qsrmagazine.com. Retrieved 28 July 2015. ^ "Chili Dog Day". Daysoftheyear.com/. Retrieved 28 July 2015. ^ Marsteller, Amanda. "Savory Scoops: Celebrate Creative Ice Cream Today". blog.cookingchanneltv.com. The Cooking Channel. Retrieved 20 July 2013. ^ Strickland, Ashley (July 1, 2011). "Breakfast buffet: National gingersnap day". eatocracy.cnn.com. CNN. Retrieved 21 July 2013. ^ Meyer, Sam (July 2, 2013). "National anisette day". eatocracy.cnn.com. CNN. Retrieved 20 July 2013. ^ Myrick, Richard. "Chocolate Wafer Fun Facts". Mobile Cuisine. Retrieved 21 October 2013. ^ Stradley, Linda. "History of Salads & Salad Dressings". whatscookingamerica.net. Stradley, Linda. Retrieved 20 July 2013. ^ Smith, Emily (July 4, 2012). "National barbecued spareribs day". eatocracy.cnn.com. CNN. Retrieved 21 October 2013. ^ Strickland, Ashley (July 4, 2011). "Breakfast buffet: National barbecue day". eatocracy.cnn.com. CNN. Retrieved 21 October 2013. ^ Smith, Emily (July 5, 2012). "History of Salads & Salad National apple turnover day". www.eatocracy.cnn.com. CNN. Retrieved 20 July 2013. ^ Covington, Linnea. "On Fried Chicken Day, new ways the South is serving up the bird". www.nbcnews.com. NBC Universal. Retrieved 20 July 2013. ^ Strickland, Ashley (7 July 2011). "Breakfast buffet: National strawberry sundae day". cnneatocracy.wordpress.com. CNN. Retrieved 9 October 2018. ^ "Breakfast buffet: National chocolate with almonds day". cnn.com. July 8, 2011. Retrieved 28 July 2015. ^ "July 8: National Chocolate With Almonds Day". Carriage Towne News. Retrieved 28 July 2015. ^ Ezell, Tim. "National Sugar Cookie Day". fox2now.com. Retrieved 20 July 2013. ^ Terrero, Nina. "Celebrate National Piña Colada Day". nbclationo.com. NBC Universal. Retrieved 20 July 2013. ^ Smith, Emily (July 11, 2013). "National blueberry muffin day". eatocracy.cnn.com. CNN. Retrieved 20 July 2013. ^ Smith, Emily (July 12, 2013). "National pecan pie day". eatocracy.cnn.com. CNN. Retrieved 20 July 2013. ^ Harris, Jenn (July 13, 2013). "National French Fry Day: Celebrate with 13 recipes for stuff to dip your fries in". latimes.com. Los Angeles Times. Retrieved 20 July 2013. ^ Cheese News, Wisconsin (July 14, 2010). "Macaroni and Wisconsin Cheese with Basil". wisconsincheesetalk.com. Wisconsin Cheese Talk. Retrieved 14 July 2014. ^ Cite error: The named reference daysoftheyear.com/days/orange-chicken-day/ was invoked but never defined (see the help page). ^ Cite error: The named reference atu-2016 was invoked but never defined (see the help page). ^ Perruzza, Stephanie. "New York Hospital Dietician Discusses The Power of Spinach". nwhc.net/. Northern Westchester Hospital. Retrieved 20 July 2013. ^ Ezell, Tim. "National Corn Fritter Day". fox2now.com. Retrieved 21 October 2013. ^ Smith, Emily (July 17, 2013). "National peach ice cream day". eatocracy.cnn.com. CNN. Retrieved 20 July 2013. ^ Paul Stern, Jared. "A Great Day in Cocktail History". luxist.com. AOL, Inc. Retrieved 20 July 2013. ^ "National fortune cookie day". National fortune cookie day – Eatocracy. July 20, 2012. Retrieved September 12, 2015. ^ "July 20: National Fortune Cookie Day". WQAD.com. July 20, 2012. Retrieved September 12, 2015. ^ Flock, Elizabeth (July 21, 2011). "National Lollipop Day: Free lollipops for all!". www.washingtonpost.com. The Washington Post. Retrieved 21 October 2013. ^ Strickland, Ashley (July 21, 2011). "Breakfast buffet: National junk food day". eatocracy.cnn.com. CNN. Retrieved 20 July 2013. ^ Strickland, Ashley (July 22, 2011). "Breakfast buffet: National penuche fudge day". eatocracy.cnn.com. CNN. Retrieved 21 July 2013. ^ "National Peanut Butter and Chocolate day". Days of the Year. July 23, 2013. Retrieved July 23, 2015. ^ "National vanilla ice cream day". National vanilla ice cream day – Eatocracy. July 23, 2013. Retrieved July 22, 2015. ^ "National Hot Dog Day". National Hot Dog Day – NATIONAL DAY CALENDAR. July 23, 2015. Retrieved July 23, 2015. ^ Meyer, Sam (July 24, 2012). "National tequila day". eatocracy.cnn.com. CNN. Retrieved 21 July 2013. ^ Patterson, Troy. "A Brief History of the Daiquiri". slate.com. The Slate Group. Retrieved 20 July 2013. ^ Strickland, Ashley (July 25, 2011). "Breakfast buffet: National hot fudge sundae day". eatocracy.cnn.com. CNN. Retrieved 21 July 2013. ^ Smith, Emily. "National coffee milkshake day". eatocracy.cnn.com. CNN. Archived from the original on July 30, 2012. Retrieved 21 July 2013. ^ Strickland, Ashley (July 27, 2011). "Breakfast buffet: National crème brûlée day". eatocracy.cnn.com. CNN. Retrieved 21 July 2013. ^ Meyer, Sam (July 27, 2012). "National scotch day". eatocracy.cnn.com. CNN. Retrieved 21 July 2013. ^ Fears, Danika. "Get your fix! 6 recipes for National Milk Chocolate Day". www.today.com. NBC. Retrieved 20 July 2013. ^ Strickland, Ashley (July 29, 2011). "Breakfast buffet: National lasagna day". eatocracy.cnn.com. CNN. Retrieved 20 July 2013. ^ Tuttle, Brad (July 29, 2015). "Best Chicken Wings Deals for National Chicken Wing Day". time.com. TIME. Retrieved 29 July 2015. ^ Zapata, Mollie. "National Cheesecake Day". csmonitor.com. Christian Science Monitor. Retrieved 20 July 2013. ^ Nunez, Alanna. "5 Healthy and Delicious Ways To Eat Raspberries". shape.com. Weider Publications, LLC. Retrieved 20 July 2013. ^ Benson, Alan (April 1997). "I'm Dreaming of a White National Cheese Day - The Selling of the American Calendar". Stay Free! (13). ^ "THE 291 NATIONAL FOOD DAYS, RANKED". Inside Hook. Retrieved 2 Sep 2016. ^ "Celebrate National Watermelon Day at BLT Steak Atlanta". Buckhead, Georgia Patch. Retrieved 28 July 2015. ^ a b "Food Days, Weeks, Months - August". UNL Food. University of Nebraska–Lincoln. ^ "A&W Restaurants". A&W Restaurants. Retrieved 2018-07-19. ^ "National S'mores Day". Holiday Insights. ^ David Minsky. "National Filet Mignon Day: $1 Steak Sandwiches at Morton's the Steakhouse". Miami New Times. Retrieved 28 July 2015. ^ GaylaJ. "National Filet Mignon Day". food.com. Retrieved 28 July 2015. ^ Denise Pritchard, WZZM (14 August 2014). "Celebrating National Creamsicle Day". WZZM 13 News. Retrieved 28 July 2015. ^ buttercreambarbie. "National Creamsicle Day". food.com. Retrieved 28 July 2015. ^ "Celebrate Lemon Meringue Pie Day". FOX2now.com. Retrieved 28 July 2015. ^ Zoe Bain. "Lemon Meringue Pie Recipes - Lemon Meringue Pie Day". Delish. Retrieved 28 July 2015. ^ "Cocktails that pack a punch for National Rum Day - NY Daily News". nydailynews.com. New York. August 15, 2013. ^ "Breakfast buffet: National vanilla custard day". cnn.com. August 17, 2011. Retrieved 28 July 2015. ^ gailanng. "National Vanilla Custard Day". food.com. Retrieved 28 July 2015. ^ Sarah Spigelman. "4 awesome potato recipes for National Potato Day". TODAY.com. Retrieved 28 July 2015. ^ "Time to Eat Spumoni! Also, Time to Learn What Spumoni Is". Bon Appétit. Retrieved 28 July 2015. ^ Tracy Saelinger. "It's National Spumoni Day! Get creative with classic dessert". TODAY.com. Retrieved 28 July 2015. ^ "National pecan torte day". cnn.com. August 21, 2012. Retrieved 28 July 2015. ^ Chicago Tribune UGC (20 August 2013). "Go Nuts. Two Days Slated to Honor the Pecan - August 20 and 21 Celebrate with a Delicious Delightful Pastries' Chocolate Pecan Bourbon Pie". chicagotribune.com. Retrieved 28 July 2015. ^ "Thursday is National 'Eat a Peach' Day". Scotts Valley, California Patch. Retrieved 28 July 2015. ^ "Days of the Year site". ^ "Here's How One Writer Invented a Totally Fake Food Holiday". ^ "August 24: National Peach Pie Day!". Enfield, Connecticut Patch. Retrieved 28 July 2015. ^ "Breakfast buffet: National peach pie day". cnn.com. August 24, 2011. Retrieved 28 July 2015. ^ Nicole Schnitzler. "Celebrate National Peach Pie Day at Red Rooster Harlem". Village Voice. Retrieved 28 July 2015. ^ Nuttle, Matthew (August 24, 2015). "9 Facts About Waffles For National Waffle Day". News9.com. Retrieved September 12, 2015. ^ Walsh, Michael (August 24, 2015). "National Waffle Day … but why? On the origin of food holidays". Yahoo News. Retrieved September 12, 2015. ^ "Celebrate National Banana Split Day With This "Titanic" Dish". Gothamist. Archived from the original on 19 June 2015. Retrieved 28 July 2015. ^ "National Banana Split Day is Aug. 25". MSU Extension. Retrieved 28 July 2015. ^ Yoli Martinez. "PHOTO GALLERY: Banana Split Day!". KCET. Retrieved 28 July 2015. ^ "How To Make The Whiskey Sour That Taylor Swift's Day-Drinking". Fox News Magazine. July 5, 2011. Retrieved 28 July 2015. ^ Eliza Mills. "Weekend Recipes: It's National Whiskey Sour Day in L.A." KCET. Retrieved 28 July 2015. ^ "National pot de creme day". cnn.com. August 27, 2012. Retrieved 28 July 2015. ^ Marg (CaymanDesigns). "National Banana Lovers Day". food.com. Retrieved 28 July 2015. ^ "Go Bananas! 14 Recipes For National Banana Lovers Day". HeraldTimesOnline. Retrieved 28 July 2015. ^ "Good food that costs less than $1". WMUR. 28 July 2015. Retrieved 28 July 2015. ^ "National cherry turnover day". cnn.com. August 28, 2012. Retrieved 28 July 2015. ^ "Obscure August Holidays". WPBF. 1 August 2013. Retrieved 28 July 2015. ^ a b "Wellcat's Summer Holidays". Ruth and Thomas Roy. Retrieved November 9, 2012. ^ "Lemon Juice, Three Ways". Food & Nutrition. Retrieved 30 August 2015. ^ "August 29 is National Chop Suey Day". Foodimentary - National Food Holidays. Retrieved 30 August 2015. ^ Burke, Joe (September 1, 2015). "National Cherry Popover Day-KALW Almanac-9/01/15". KALW. Retrieved September 28, 2015. ^ "National Cherry Popover Day, September 1". Food.com. September 1, 2015. Retrieved September 28, 2015. ^ McMaster, Sean (September 2, 2014). "Today Is….National Blueberry Popsicle Day! Do You Know How The Popsicle Came To Be?". Today's Country - 107.7 WGNA. Retrieved September 12, 2015. ^ Wright, Mary Ellen (August 31, 2015). 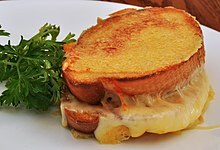 "Meatless Monday: Celebrate National Welsh Rarebit Day with traditional, hearty cheese dish". LancasterOnline. Retrieved September 28, 2015. ^ "National Welsh rarebit day". National Welsh rarebit day – Eatocracy. September 3, 2012. Retrieved September 28, 2015. ^ a b c d e f g h i j k l "Food Days, Weeks, Months - September". UNL Food. University of Nebraska–Lincoln. ^ "National coffee ice cream day". cnn.com. September 6, 2012. Retrieved 27 July 2015. ^ "September 7 is National Beer Lovers Day". AL.com. September 7, 2014. Retrieved 11 September 2014. ^ "September 7 is National Beer Lovers Day". Foodimentary. ^ "Celebrating Salami". Grove Sun - Delaware County Journal. Retrieved 27 July 2015. ^ a b c "Let's Celebrate September's food holidays!". The Gazette. Retrieved 27 July 2015. ^ "Breakfast Buffet". cnn.com. September 14, 2010. Retrieved 27 July 2015. ^ "5 Great Recipes to Whip Up on National TV Dinner Day". Fox News Magazine. July 5, 2011. Retrieved 27 July 2015. ^ "National Chocolate Milkshake Day". WPMT FOX43. Retrieved 27 July 2015. ^ Sharon123. "National Chocolate Milkshake Day". food.com. Retrieved 27 July 2015. ^ "5 easy recipes to celebrate International Chocolate day". Deccan Chronicle. Retrieved 27 July 2015. ^ Polansky, Rob (September 14, 2015). "Today is National Cream Filled Donut Day". WFSB 3 Connecticut. Retrieved September 28, 2015. ^ Robins, Paul (September 15, 2015). "Learning How to Make Cheese Toast". FOX40. Retrieved September 28, 2015. ^ Redfern, Jay (September 16, 2011). "Turning up the heat; healthy women invade Seminary Street". The Register-Mail. Retrieved September 28, 2015. ^ Q, Big (September 17, 2015). "National Monte Cristo Sandwich Day". K-101.7. Retrieved September 28, 2015. ^ "National cheeseburger day". Eatocracy. CNN. 2012-09-18. Retrieved 2012-11-04. ^ "National Pepperoni Pizza Day". 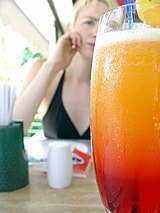 ^ a b "Make it a double: It's National Rum Punch Day AND National Punch Day". CNN.com Blogs. September 20, 2012. Retrieved September 28, 2015. ^ "7 Ways To Toast National Punch Day". The Huffington Post. September 19, 2011. Retrieved September 28, 2015. ^ "National Rum Punch Day, September 20". Food.com. September 1, 2015. Retrieved September 28, 2015. ^ "National Pecan Cookie Day, September 21". Food.com. September 1, 2015. Retrieved September 28, 2015. ^ "Senate passes King, Collins National Lobster Day resolution". WCSH6. 6 August 2015. Retrieved 30 August 2015. ^ "Holidays". statesymbolsusa.org. Retrieved 9 May 2015. ^ "The 2015 Chef One Dumpling Festival Set To Feature Varieties From Around The World". Gothamist. Archived from the original on 26 September 2015. Retrieved 28 September 2015. ^ "National Chocolate Milk Day". punchbowl.com. Retrieved 28 September 2015. ^ Steve Duval (15 September 2015). "National Chocolate Milk Day is Sept. 27th". fox28.com. Retrieved 28 September 2015. ^ AnydayGuide. "National Corned Beef Hash Day / September 27, 2015". AnydayGuide. Retrieved 28 September 2015. ^ "National Corned Beef Hash Day - Fun Food Holidays for September @ CDKitchen". CDKitchen. Retrieved 28 September 2015. ^ Long, Amy (September 28, 2009). "Monday Is Family Dinner Night". WCTV. ^ Lori Grisham, USA TODAY Network (29 September 2014). "National Coffee Day! Here's a list of freebies". USA TODAY. Retrieved 27 July 2015. ^ "Get your free caffeine fix on National Coffee Day". Fox News. September 29, 2014. Retrieved 27 July 2015. ^ "14 Offbeat Holidays You Can Celebrate in September". 1 September 2016. ^ "National Biscotti Day". nationalbiscottiday.com. ^ National Noodle Day. "October 6, 2015". ^ National Fluffernutter Day. "October 8, 2015". ^ "3 Sausage Pizza Recipes for National Sausage Pizza Day, Use It". North Dallas Gazette. 11 October 2014. Retrieved December 16, 2014. ^ "October 11 is National Sausage Day". Foodimentary. ^ National Day Calendar. "October 14, 2013". ^ National Day Calendar. "October 18, 2014 National Chocolate Cupcake Day!". ^ a b c Weibel, Alexa. "Happy National Brandied Fruit Day!". slashfood.com. Retrieved 21 October 2013. ^ Strickland, Ashley (October 24, 2011). "Breakfast buffet: National bologna day". eatocracy.cnn.com. CNN. Retrieved 21 October 2013. ^ "About - Food Day". Center for Science in the Public Interest. ^ "Eateries mark Greasy Foods Day". United Press International. October 26, 2011. ^ "National greesy food day". Eatocracy. CNN. October 25, 2012. ^ a b "Food Days, Weeks, Months - October". UNL Food. University of Nebraska–Lincoln. ^ a b "Wellcat's Fall Holidays". Ruth and Thomas Roy. Retrieved November 9, 2012. ^ "Ode to Candy Corn". NPR. October 28, 2007. ^ Smith, Emily (October 31, 2012). "National candy apple day". eatocracy.cnn.com. Retrieved 1 November 2013. ^ "Candy Holidays". candyusa.com. National Confectioners Association. Archived from the original on 29 October 2013. Retrieved 1 November 2013. ^ "Bon Appetite: Nov. 3 is Nat'l Men Make Dinner Day". Christian Broadcasting Network. November 2, 2011. ^ "Men Make Dinner Day : 1 November". cooksinfo.com. 2012. ^ Isger, Sonja (November 3, 2011). "National Men Make Dinner Day has arrived; what's on your menu?". The Palm Beach Post. ^ Lloyd Ellman (2011-11-29). "Turkey Day". The Slow Food USA Blog. Slow Food USA. Retrieved 2012-11-04. ^ Dan Shafto. "Turkey Day Quiz". Family Education. Pearson Education, Inc. Retrieved 2012-11-04. ^ " "National Eating Healthy Day". Heart.org. 15 Oct 2015. ^ "National vinegar day". ketknbc.com. Retrieved 28 July 2015. ^ Andi of Longmeadow Farm. "National Vinegar Day". food.com. Retrieved 28 July 2015. ^ "Restaurant Marketing Ideas for November". RestaurantNews.com. Retrieved 27 July 2015. ^ a b Pokorny, Sara (November 1, 2012). "Cook for your pet, get in some gaming, keep an eye out for circles, walk like an Egyptian, don a Guy Fawkes mask and hey, while you're at it, why not get lost?". Times Leader. ^ a b c d e f g h i "Food Days, Weeks, Months - November". UNL Food. University of Nebraska–Lincoln. ^ "National Bison Day". National Day Calendar. 2016-11-06. Retrieved 2018-02-09. ^ Jennings, Zeke (November 3, 2012). "National Sandwich Day begs the question: Where to get the best sandwich in Jackson?". Booth Newspapers. ^ Rossen, Jake (2017-06-02). "Why Are There Two National Doughnut Days?". Mental Floss. Retrieved 2018-05-24. ^ "Bang Your Head for National Harvey Wallbanger Day". chilledmagazine.com. Retrieved 27 July 2015. ^ "National scrapple day". cnn.com. November 9, 2012. Retrieved 27 July 2015. ^ Andi of Longmeadow Farm. "National Scrapple Day". food.com. Retrieved 27 July 2015. ^ Santoski, Teresa (November 11, 2009). "Daily TWiP - National Sundae Day". The Telegraph (Nashua). ^ Stallsmith, Shelly (November 12, 2012). "Good morning, central Pa". The Patriot-News. ^ a b c d "National Drink Days Calendar". mixologydiary.com. 2015. ^ AnydayGuide. "National Indian Pudding Day / November 13, 2017". Retrieved 1 February 2017. ^ "In Tacoma, a hunt to celebrate National Pickle Day". KOMO News. Retrieved 27 July 2015. ^ flower7. "National Pickle Day". food.com. Archived from the original on 7 May 2015. Retrieved 27 July 2015. ^ "Spicy Guacamole Day 2015". Retrieved 1 February 2017. ^ "November 15 is National Clean Out Your Refrigerator Day". International Business Times. ^ "National fast food day". cnn.com. November 16, 2012. Retrieved 27 July 2015. ^ gailanng. "National Fast Food Day". food.com. Retrieved 27 July 2015. ^ "November 17th is National Baklava Day". WTNH Connecticut News. Retrieved 27 July 2015. ^ "National Apple Cider Day: 11/18". Fairview. 17 November 2015. Retrieved 23 October 2017. ^ "Breakfast buffet: National vichyssoise day". Eatocracy. CNN. November 18, 2011. ^ "Today's Holidays – November 19, 2011". Vicksburg Daily News. Retrieved 27 July 2015. ^ "Some Stuff about Stuffing". Academy of Nutrition and Dietetics. November 21, 2008. ^ D’Silva, Melissa D’Costa (November 22, 2014). "National Cashew Day- A great excuse to gorge on delicious food". Daily News and Analysis. Retrieved April 14, 2016. ^ Painter, Alysia Gray (March 9, 2009). "Let's Have a Double: National Espresso Day". NBC Los Angeles. ^ "National Lemon Cream Pie Day". Retrieved 1 February 2017. ^ a b c d "Food Days, Weeks, Months - December". UNL Food. University of Nebraska–Lincoln. ^ Co, Sun Publishing. "An apple fritter recipe perfect for National Fritters Day on Friday". The Westerly Sun. Retrieved 1 February 2017. ^ NANCY RIVERA BROOKS (August 30, 1987). "'National Cookie Day' Could Be Blue Chip Event-". Los Angeles Times. ^ "Blue Chip, Founders of National Cookie Day 1987". ^ "6 recipes for National Pastry Day". Retrieved 1 February 2017. ^ Ansberry, Clare (11 December 2014). "Today Is National Noodle Ring Day, So If You've Got a Bundt Pan, Use It". The Wall Street Journal. Retrieved December 16, 2014. ^ "December 11 is National Noodle Ring Day". Foodimentary. ^ "December 11 is National Have a Bagel's Day". Foodimentary. ^ "December 13, 2016 – NATIONAL COCOA DAY". ^ "Learn How-To Frost Cupcakes for National Cupcake Day! - InStyle.com". InStyle.com. Retrieved 27 July 2015. ^ "National Green Chili Day". FoodSided. 2014-12-16. Retrieved 2018-11-16. ^ "National Green Chili Day | EventGuide". www.eventguide.com. Retrieved 2018-11-16. 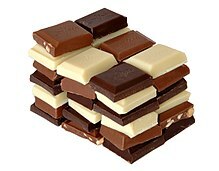 ^ "December 16th is National Chocolate Covered Anything Day!". Foodimentary - National Food Holidays. 16 December 2016. Retrieved 23 October 2017. ^ "Maple Syrup Day". Cute-Calendar.com. October 8, 2014. ^ "National Sangria Day". Cute-Calendar.com. October 8, 2014. ^ "National Date Nut Bread Day". ^ "National Champagne day". cnn.com. December 31, 2012. Retrieved 27 July 2015. ^ gailanng. "National Champagne Day". food.com. Retrieved 27 July 2015.